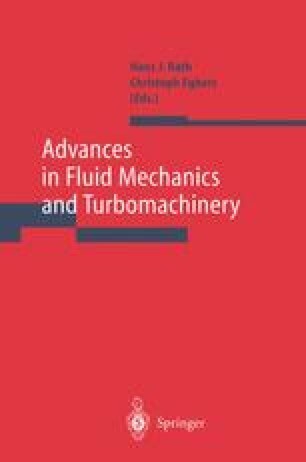 A two- and three-dimensional code solving the Reynolds-averaged compressible Navier-Stokes equations has been developed and successfully used for computation of the steady flow field in an aerodynamic diffuser of a high loaded centrifugal compressor. For the purpose of comparison the turbulence model of Baldwin and Lomax with and without an extension of Goldberg and Chakravarthy  for the determination of separated flow regions and the two equation k — ε model according to Kunz and Lakshminarayana [2, 3] are applied to compute the flow field of the diffuser on several operating points with the two-dimensional code. The three-dimensional solver in addition with the extended and unextended Baldwin-Lomax model has been applied to ascertain the three-dimensional flow field on the working point with the largest separation zone in the two-dimensional case. For comparison measured pressure distributions  of the examined operating points are presented likewise. partial derivatives ξ, ŋ,.. to x,y,..